A man hit by a car during a fight near a London Underground station has died, sparking a murder investigation. 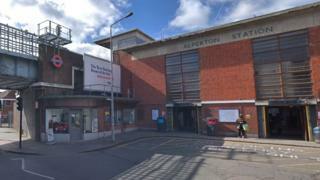 Violence broke out between a group of people near Alperton Tube in Ealing Road, Wembley, north-west London, at about 01:30 BST on Tuesday. During the melee, a car hit two men. One victim, aged 27, died in hospital hours later. His family has been informed. Six people are being held on suspicion of murder. A 21-year-old man who was also hit by the car has been discharged from hospital, the Metropolitan Police said. The force said nine men were arrested at the scene on suspicion of affray. All remain in custody. Six of the men have now been further arrested on suspicion of murder, while one was further arrested on suspicion of attempted murder.